This is one of my favorites for its lovely scent. I have lavender growing along the gravel path to my studio and delight in it daily. The bees like it too and I've added one to the painting. 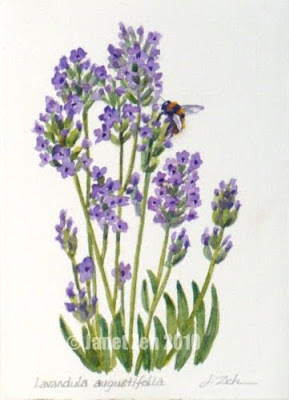 The lavender flowers are rarely without a number of them collecting nectar from the blossoms. You can get the print at Prints.ZehOriginalArt.com in the botanical section. Thanks for stopping by today!